This phrase has become one of the overarching sentiments of 2014, echoed by everyone from industry entrepreneurs to corporate CEOs at some of the world’s largest payments and banking giants. Though the statement has been both praised and knocked, it successfully highlights how the bitcoin industry has evolved in the last 12 months. No longer is bitcoin’s technology viewed as disruptive only to the financial world. Rather, a new class of entrepreneurs is seeking to uncover how bitcoin’s underlying ledger technology can be used to build everything from decentralized social apps to file storage services. To take these applications even further, however, the crypto 2.0 segment of the bitcoin community will need a new wave of developers who recognize this vision. Amidst this backdrop, Blockchain University held its launch event yesterday at the Consensus HQ co-working space in Mountain View, California. 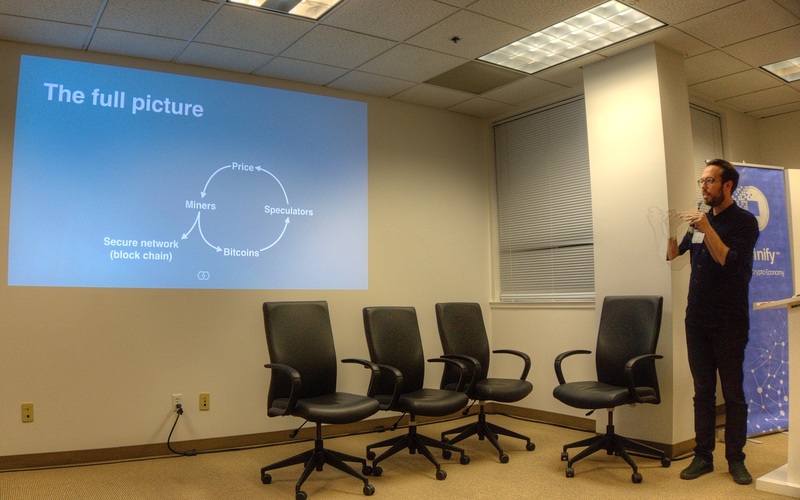 The inaugural event consisted of presentations designed to inform the audience about the program’s curriculum and to give compelling reasons why developers should learn how to build applications on top of bitcoin’s blockchain. Around 75 people attended the launch, which was was sponsored by Koinify, Skuchain and China Fortune Land Development (CFLD), a real-estate investment company. Notably, CFLD is building an incubator at Consensus HQ with the aim of investing in startups that focus broadly on blockchain technology as well as IT, clean energy and bioscience. 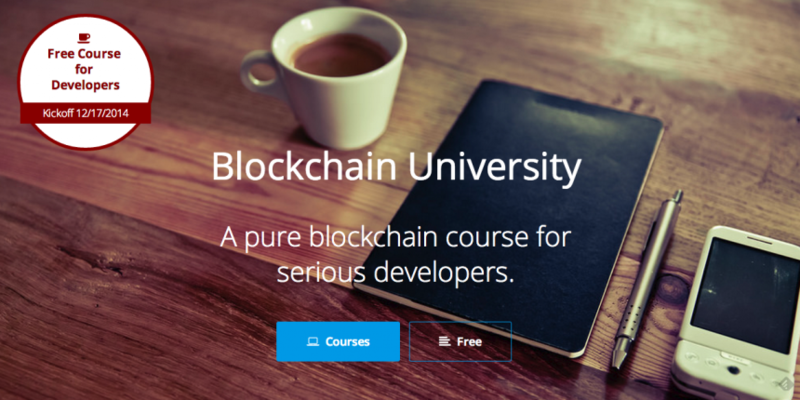 Described as “a pure blockchain course for serious developers”, Blockchain University is a free 10-week program that starts January 10, 2015. Giving the keynote speech at the launch was Adam Ludwin, CEO of blockchain API provider Chain. Ludwin made a short presentation that sought to underscore the promise of blockchain technology, his remarks aimed at encouraging attending developers to think big when innovating in the space. Chain CEO Adam Ludwin talks about blockchain security as an avenue for bitcoin application development. 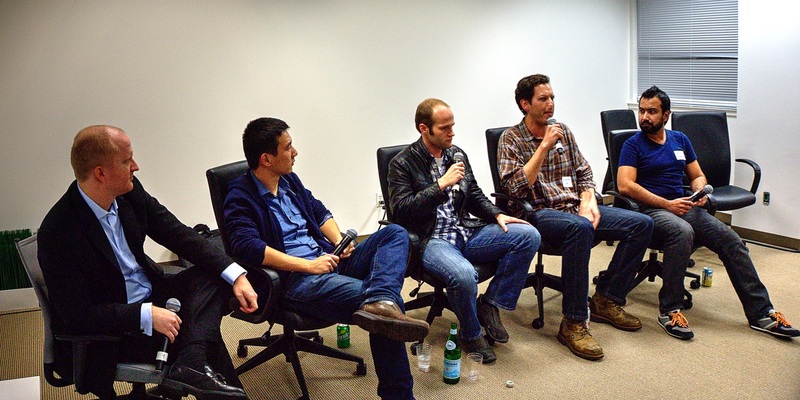 The talk provided further evidence that some of bitcoin’s more mainstream companies see the larger vision for how they could enable a broader bitcoin ecosystem. The coming year will primarily focus on building blockchain-based apps on bitcoin’s secure network, protected by the hashing power of miners, Ludwin said. He cited Skuchain, a stealth startup aimed at disrupting the logistics industry, as a “cool” example of that. Blockchain University instructor Zaki Manian, a founder at SKUChain, echoed the same sentiment during his short presentation, though he hinted at some of the technology issues that may prevent this goal. “Proof of work is scarce. There’s only one proof of work [coin] that has the mining power that stands behind bitcoin,” he said. After the speaker presentations, there followed a panel session, moderated by author Tim Swanson. Taking part were Blockchain University instructors Tom Ding, CEO of Koinify; Ryan X Charles, cryptocurrency engineer at Reddit; Ryan Smith, CTO of Chain; and Atif Nazir, CEO of Block.io. (L-R) Swanson, Ding, Charles, Smith, Nazir. Charles, who as a cryptocurrency engineer at Reddit said he is working on some interesting products, sees massive potential for bitcoin’s blockchain to be a dominating force in technology going forward and at his mainstream social media company. “[Bitcoin] is really just not like anything that has happened before. The sky is literally the limit,” he said. Block.io’s Nazir, whose company builds API products for blockchain and wallet applications, indicated that the purpose of Blockchain University is to get developers up to speed in very little time – something that could be very valuable both to busy people and an ecosystem that needs talented programmers. Of course, while those involved may have a larger vision, the course will emphasize the basics over its run. Leading operations for the course will be Robert Schwentker, who previously helmed PayPal’s Startup Blueprint program. The initial half of the Blockchain University program will focus on building basic apps, such as a blockchain explorer, while the second half will be concerned with creating decentralized applications using blockchain technology to provide a public trust mechanism. Other notable instructors for Blockchain University will include Ethereum founder Vitalik Buterin and BlockCypher CTO Matthieu Riou, both of whom have demonstrated an interest in expanding bitcoin’s technology to more advanced applications. Applications for the free course, which requires some software development experience and a commitment to attend several hours every Saturday, are due by the end of December. There will be a demo day in March of projects developed by the course’s students. For more information and to apply, visit the Blockchain University official website.